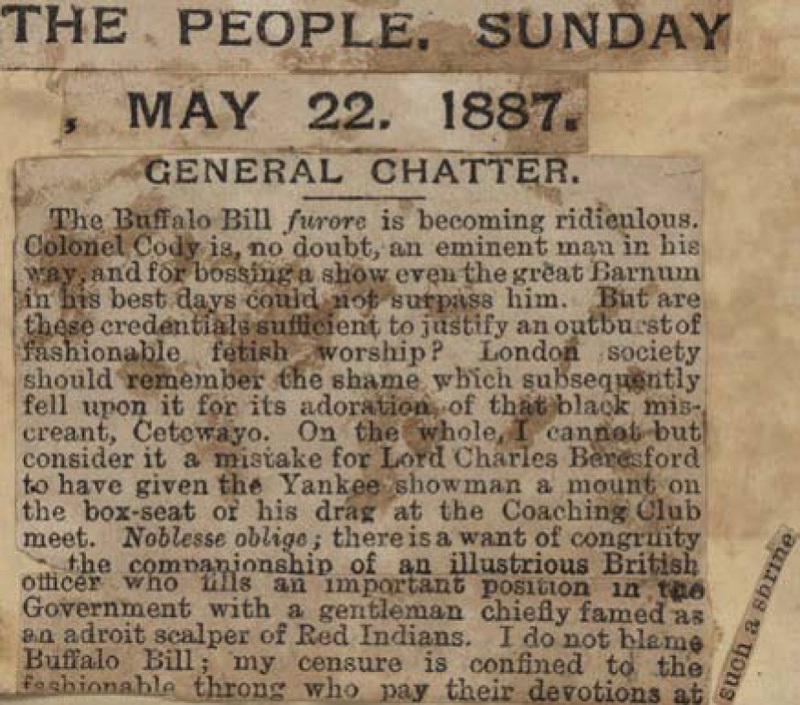 The Buffalo Bill furore is becoming ridiculous. Colonel Cody is, no doubt, an eminent man in his way, and for bossing a show even the great Barnum in his best days could not surpass him. But are these credentials sufficient to justify an outburst of fashionable fetish worship? London society should remember the shame which subsequently fell upon it for its adoration of that black miscreant, Cetewayo. On the whole, I cannot but consider it a mistake for Lord Charles Beresford to have given the Yankee showman a mount on the box-seat of his drag at the Coaching Club meet. Noblesse oblige; there is a want of congruity in the companionship of an illustrious British officer who fills an important position in the Government with a gentleman chiefly famed as an adroit scalper of Red Indians. 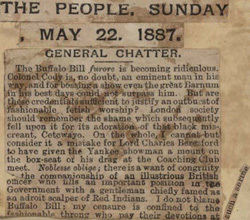 I do not blame Buffalo Bill; my censure is confined to the fashionable throng who pay their devotions at such a shrine.